If you’re looking to upgrade your indoor or outdoor surveillance system to keep an eye on every nook and cranny of your house or small business, a PTZ camera could be a great addition to your humble abode. PTZ—pan, tilt, zoom—cameras let you see your home from multiple angles so you can make sure your pets, plants, and other valuables are safe. We’ve put together a list of the best indoor PTZ security cameras and the best outdoor PTZ security cameras. Here are our favorites. Night vision Up to 32 ft. Up to 40 ft. Up to 33 ft.
Up to 32 ft. Up to 40 ft. Up to 33 ft.
*Standard retail prices as of 2/22/2019. Prices and availability are subject to change and can vary by retailer. An indoor PTZ security camera helps you keep an eye on your family and your pets while you’re away from home. Here are our top three picks. 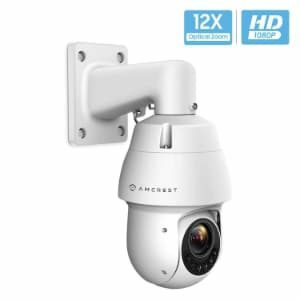 This Amcrest surveillance camera has UltraHD resolution and a superwide viewing angle. It also has impressive PTZ capabilities with 360º pan, a 90º tilt, and 16x digital zoom. The UltraHD PTZ camera also has multiple storage options: you can livestream and play back video footage through Amcrest’s cloud service or record directly to a MicroSD card. You can also watch footage via Amcrest’s app. ASecureLife’s recommendation: Amcrest’s UltraHD camera is a solid choice for an indoor PTZ IP camera with pan, tilt, and zoom capabilities. We recommend it highly—and we recommend some patience if it’s your first DIY camera installation. 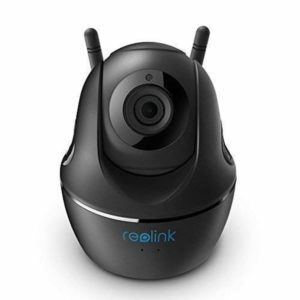 Reolink C1 Pro offers a crisp picture and a wide rotating angle. Users say setup is simple, the app is easy to navigate, and the image quality is great. Reolink offers you some flexibility when it comes to your recordings: instead of committing to a cloud subscription, you can purchase an SD card and record up to 64GB of footage. ASecureLife’s recommendation: Even without any zoom functionality, the Reolink C1 Pro is a reliable PTZ camera. Since it has such strong pan and tilt capabilities, we think it would work best in a room where you want to keep an eye on something mobile, like a small child or a family pet. 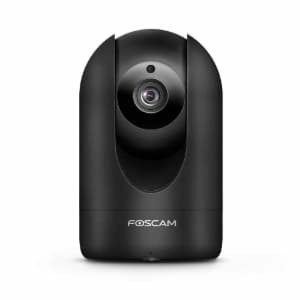 The Foscam R4 has excellent picture quality, lets you scan a room remotely, and offers nearly whole-room coverage. Plus, Foscam offers a 24-hour live call service to help you identify and rectify any issues with your product no matter what time a problem comes up. ASecureLife’s recommendation: If you’re looking for an inexpensive starter PTZ camera, we recommend this one. The Foscam R4 has great image quality at a cheaper price than most PTZ security cameras. Night vision Up to 328 ft. Up to 328 ft. Up to 165 ft.
Up to 328 ft. Up to 328 ft. Up to 165 ft.
An outdoor PTZ camera can help you protect your home from intruders and keep an eye on packages and people. Here are our top three picks. This dome camera has a substantial 360º pan, 90º tilt, and both a digital zoom (up to 16x) and a motorized optical zoom (up to 12x). An optical zoom offers a clearer image, so you’ll see more detail in your security footage. It also has one of the highest FPS rates we’ve seen in PTZ cameras. Sunba’s Mini PTZ camera is small—about four inches tall—but it’s mighty. It lets you cover a wide area with 20x optical zoom, a 360º pan, and a 90º tilt. 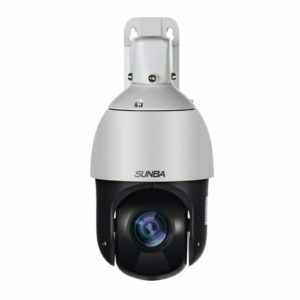 ASecureLife’s recommendation: Sunba’s Mini PTZ Camera would work well in front of a small business. It’s compact, and perhaps a little bit less noticeable, but it will still capture high-quality images with its high FPS rate and impressive optical zoom. 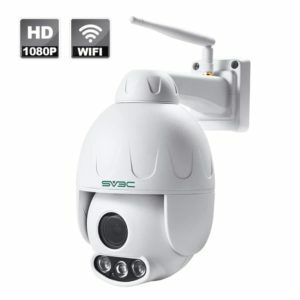 The SV3C PTZ camera has some impressive specs, including 5x optical zoom, 355º pan and 120º tilt, and three IR LEDs for a night vision range up to 165 feet. And it’s still less expensive than other outdoor PTZ cameras. 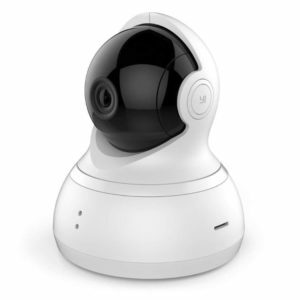 ASecureLife’s recommendation: SV3C’s outdoor PTZ camera is a great get if you’re on a budget. We also recommend it if you already have a dual-band router. It’ll help make sure your camera doesn’t take up too much bandwidth and slow down your internet connection. To find the best indoor and outdoor PTZ cameras, we considered user reviews and experience. We also focused on the technical stuff, including angle of view, the camera’s frames per second (FPS), and whether the camera is ONVIF compliant. The term angle of view is used interchangeably with viewing angle or field of view. These terms refer to the area that a camera can see in any given frame. The bigger the number, the greater area the camera will cover. Frame rates—the rate at which consecutive frame images appear—are measured in frames per second. When a camera has a higher FPS, playback is smoother and the visuals are clearer. ONVIF (Open Network Video Interface Forum) allows cameras to communicate with NVRs (network video recorders). Most ONVIF-compliant cameras will work with an ONVIF-compatible NVR. All the cameras we’ve listed here are ONVIF compliant. An IR LED is an infrared LED (light-emitting diode). In security cameras, IR LEDs help cameras see in low light, giving the camera night vision capabilities. Many of the PTZ cameras we recommend have optical zoom, digital zoom, or both. There’s a key difference: Optical zoom offers a clearer image, as it’s similar to the type of zoom you’d find on a film camera. Digital zoom, on the other hand, is in-camera image processing—no true zoom is involved. 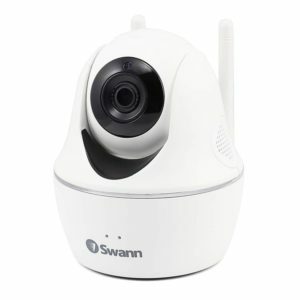 Swann’s Wireless Pan & Tilt security camera has some solid features and an easy installation process. But users note this camera doesn’t support push notifications and connecting remotely isn’t always possible. YI’s PTZ Dome Camera is a popular choice and one of Amazon’s best sellers. But we’re concerned about YI’s lack of security: customer complaints say YI compromises their privacy. We think most people will be satisfied with the Amcrest UltraHD PTZ camera indoors or the Amcrest ProHD Dome camera outdoors. Both offer substantial pan, tilt, and zoom functionality, giving you a clear and comprehensive view of your home. >>Ready to see your home from every angle? 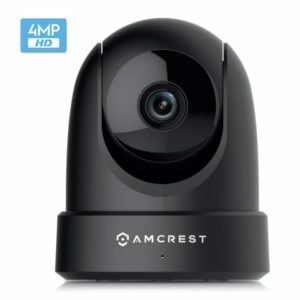 Buy the Amcrest UltraHD PTZ Camera or the Amcrest ProHD Dome Camera.